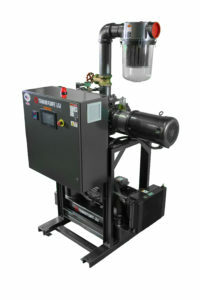 Travaini’s new series of compact, high vacuum packages are capable of a working vacuum level of 29.86. HgV and flow rates up to 2100 ACFM. This new design has been developed through a partnership with Bora Blowers and Travaini Pumps USA. Bora Blowers specializes in the manufacturing of boosters for pressure and vacuum applications. Leveraging Bora’s sophisticated electronics for controlling boosters, the partnership customized the technology to couple the liquid ring vacuum pump and the booster. This innovation, along with a unique sensor configuration, allows precise control and protection that traditional packages simply can’t offer. State of the art Technology: The DVD2 “Digital Vacuum Drive” controller and unique sensor configuration maintain even temperature by controlling compression rates. This prevents the elevated temperatures to protect the booster. 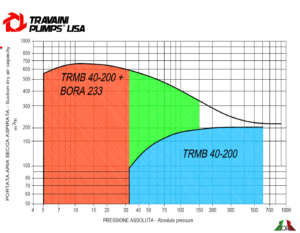 Plug and Play: Multiple preset modes applied at Travaini provide a ready-to-use product. This saves you time reprogramming for different processes or shift changes. Additional adjustments are easy to make. This slide illustrates how a 10hp Liquid Ring Vacuum Pump operates alone (blue) and then how it operates with only a 5hp booster added, (red). The significant gain in capacity is presented in green. This 15hp package will give the same flow and deeper vacuum than a 30hp two stage pump. In high volume, critical applications where strict control of high vacuum levels are imperative, these packages from Travaini are the logical solution. Lewis Systems will be happy to take a look at your current applications or help you with designing your next system. Contact us today.